Welcome to my blog! 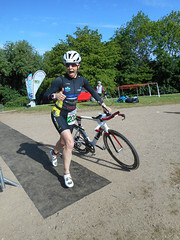 I am a 38-year old amateur triathlete with a passion for life and love of the great outdoors, be it on foot, mountain bike, road bike or snowboard. I am joined on many of these adventures by my loyal companion; Chilli the Labrador retriever. I Love to run and cycle and have done these both as a way of trying to keep fit for several years. 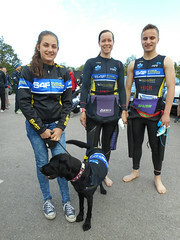 My introduction into triathlon happened one day when I was bored at the gym just after moving to Hertfordshire and I decide I wanted to learn to swim front crawl. So why not just learn to swim like most normal people would? Well, I love a challenge so I figured back in 2011 If I entered a triathlon I would have no choice but to sink or swim – literally! 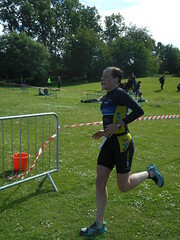 Luckily, on my first triathlon, the ladies only ‘shock absorber’ Eton sprint I managed to not sink! Albeit I half swam, half doggy paddled, until I got around the 400m open water swim. So that is where it all began; fast forward 3 years and since I then I have just taken part in many sprint and Olympic triathlons, 3 IM distance races and 2 middle distance with PB’s of 12:14 and 5:29 respectively. In 2013 I also qualified as a GB Age grouper so 2014 saw my first race in GB kit. My future aim is to improve my IM race time sufficiently to have a crack at winning a place to Kona IM World Championships in the coming years although I’m aware I am a long way off that yet – but we all need a 5 year plan in our lives….. Please follow my blog as I write about my training adventures and report on my races over the coming months and years – maybe I’ll even see you at the Start line! A sub-13 IM in just 2 years! That’s pretty impressive. I just did my first tri and know all about slogging through the water. Good luck on getting to Kona! Having done Kona Ironman, I will say there is nothing like it! Go for it…I always say “Set your goals higher than you can see right now….” Best of luck to you! Congrats on your Ironman 🙂 I just did Ironman CDA in June and have signed up for IM Tahoe next September. Excited to follow your adventures! Congrats on your race! I just did IM CDA and signed up for IM Tahoe next year. Looking forward to tracking your progress. I’m incredibly impressed with your first IM. Amazing. I appreciate your sharing that your sites are set on Kona and you’re going for it. I love bold goals! That sounds great. I am sat on my bed finding excuses again, instead of going for sa bike ride. So thanks for your blogs, I am off for the ride. Thanks for visiting. Wow, you’ve done really well. I never was a swimmer and do a lot side stroke/back stroke on the swims. It is the freaky part of the tri’s I’ve done. I live on a river but no where close to swimmable water. I’m fine with that and probably won’t do them like you do. I enjoy 5/10 K’s and would like to run a half marathon. Reading your posts on training you have helped me with some answers I needed for an essay I am doing on different training programs for runners. Thanks for stopping by my blog. Your achievements have been amazing!